Sarah Butler was writer-in-residence in Lower Belvedere throughout 2010. Her commission (from Bexley council, funded through the Heritage Lottery Scheme) was linked to a large regeneration scheme in the area, focused on infrastructure and public realm improvements. Sarah’s commission was to collect stories from local communities and create a series of new text pieces to be installed in the area. A range of the stories are now online and the installation of the texts is currently in progress. 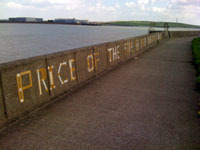 Lower Belvedere, in the London Borough of Bexley, is a fascinating area, once a broad stretch of marshland, close to the Pleasure Gardens at Erith, it is now home to Crossness Sewage Works, a huge new rubbish incinerator, an industrial estate, and a tiny patch of precious marshland, some of which is designated a protected Nature Reserve. Sarah worked with Year 8 students at Trinity School to explore the marshland’s history and ecology. 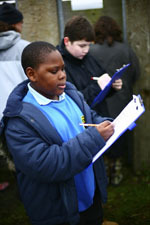 Sessions included work with the Local Studies Department, and the council planning department. The students responded creatively to the area, creating myths, historical fictions, and proposing a new name for one of the many drainage dykes in the area. The project was part of CABE’s Engaging Places Scheme. You can read some of the students’ responses to the project so far on the Engaging Places Website.